Helloooo everybody! 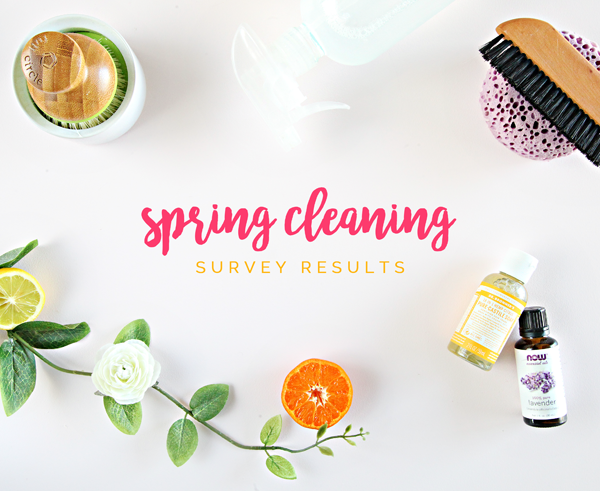 I want to start out by giving many, many thanks to every last one of you who took the time to answer a few spring cleaning specific questions in my survey last week! Part of me wanted to wait for three more responses... But do you see that number?! 1,597 responses is AH-MAZING! Without further adieu, here are the results of the six general questions. I love this result! 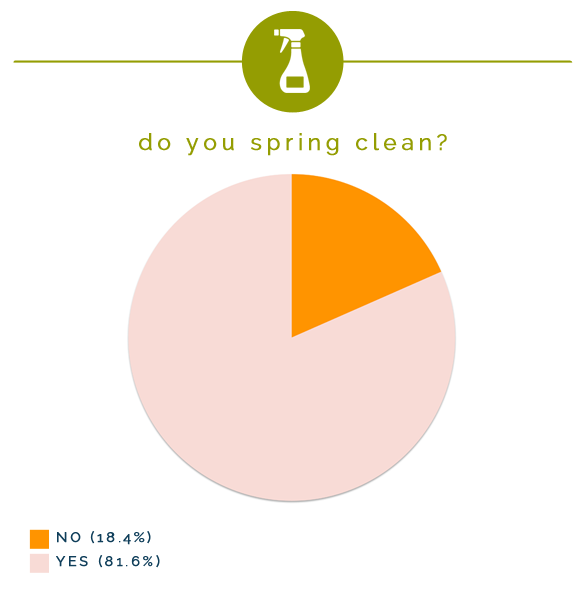 Over 80% of you spring clean! Extra daylight and warmer weather generally encourages people to naturally open windows, purge a closet, grab a mop and prep the home for the upcoming spring and summer months. I was most surprised by these results. 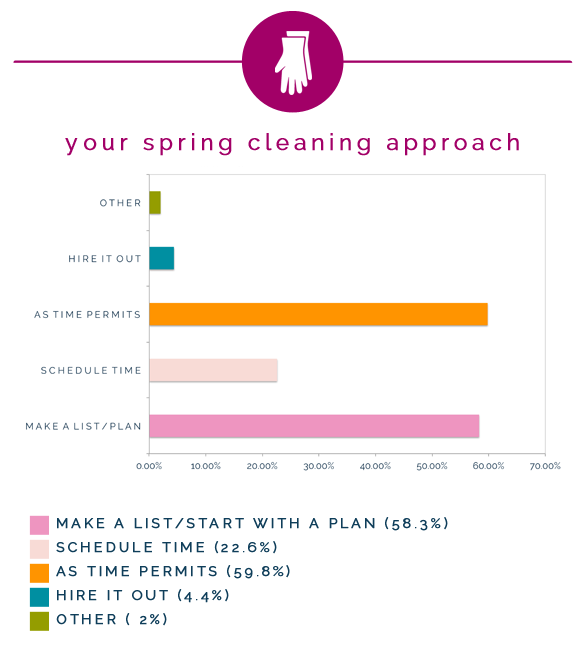 I mean, I do write an organizing blog so I guess I should have assumed that most of my readers use spring as a prime time to dig into a few problematic clutter spots. But I guess I just thought most people cleaned or focussed on home maintenance items this time of the year. This was really eye opening and of course, I LOVE this! This one makes sense, and I think I fall into the popular vote as well. 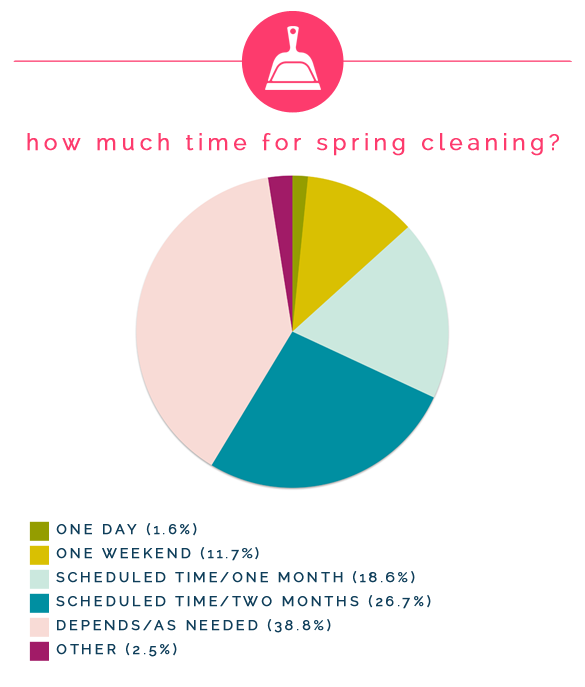 38.8% of you spring clean as needed, and it looks like many of you also work on it over the course of two months. 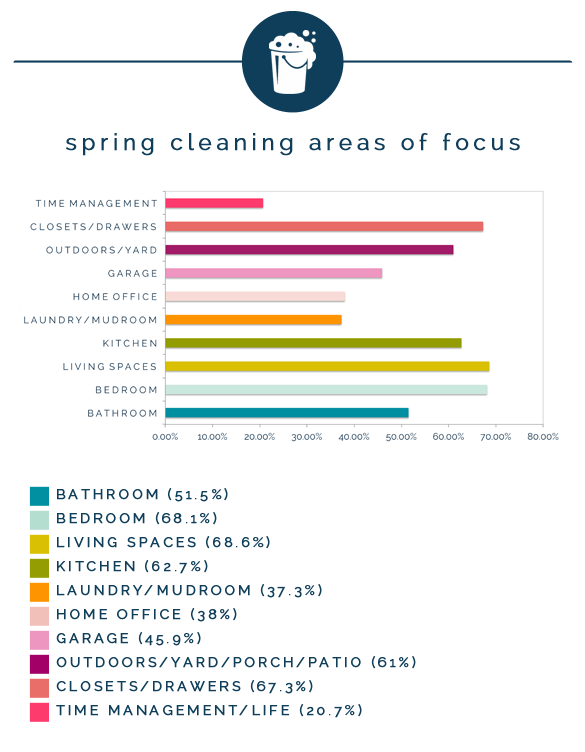 Another shocker, the bedroom and living spaces are your top areas of focus this time of year. Closets and drawers are right up there as well. This really is a wonderful time to declutter clothing closets and drawers as you transition your wardrobes for spring and summer temps. Because we haven't seen our yard for about five months, we are really looking forward to doing a few outdoor chores. 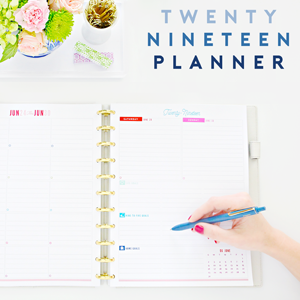 Now that we know where you focus and how much time you invest, it was fun to see that you go after those areas with a list and a plan, but also as your time permits (vs. scheduling the time in advance). I have gone through a lot of trials in this department, and at one time was ready to give up on it because some of the recipes were just too complex. I now try to have a 2-3 ingredient maximum and still achieve wonderful results. The most helpful, beneficial and fun part of the survey was the area for you to share general comments in regards to what specifically you would like to learn more about. There were quite a few themes that I recognized as I read through the abundant amount of responses, so I categorized them the best I could to create a visual summary. 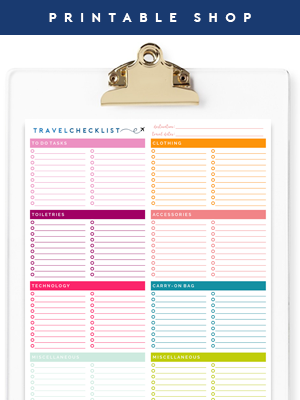 The overwhelming response was that printables are a helpful tool, especially if I can offer specific cleaning plans, calendars, checklists, etc... Many of you expressed the want to squash that overwhelming feeling and also want to be sure that you are tackling areas that are often times overlooked and forgotten. 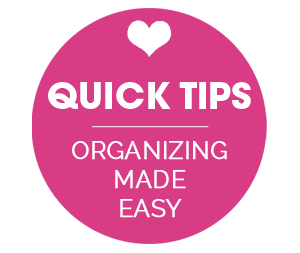 Another common theme is that you all are looking for tips for being efficient with time, quick hacks and ways to get the kiddos involved. 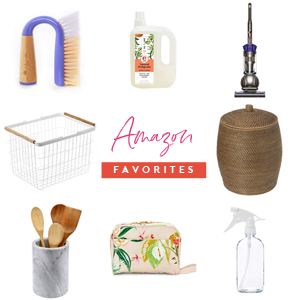 A few would like help with specific cleaning tasks and rooms and even with decluttering/purging. And finally, many of you asked how to make it more fun and enjoyable. I think if I can figure that out, I will be the smartest, wealthiest gal on the planet. But that doesn't mean I am not going to try, I hope to at least come up with a few ways to make it a little less painful. Thank you again to all of you that took the time to share your excitement, questions, and answers. 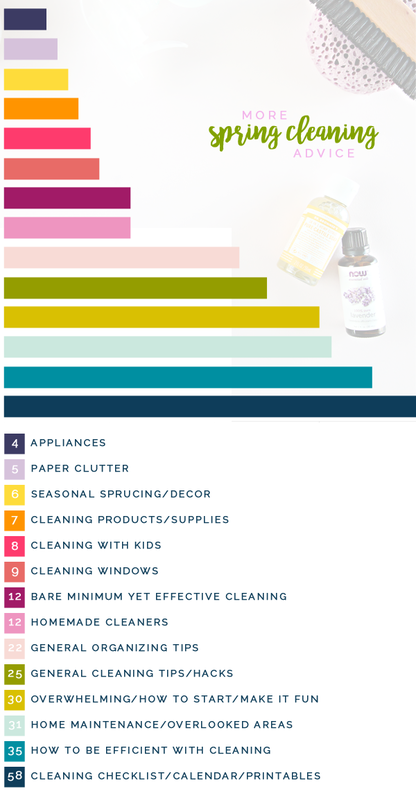 I am more motivated than ever to bring some new cleaning content to the site, as well as a few helpful printables. This kind of thing (both surveys and cleaning chit chat) is what fuels my fire! 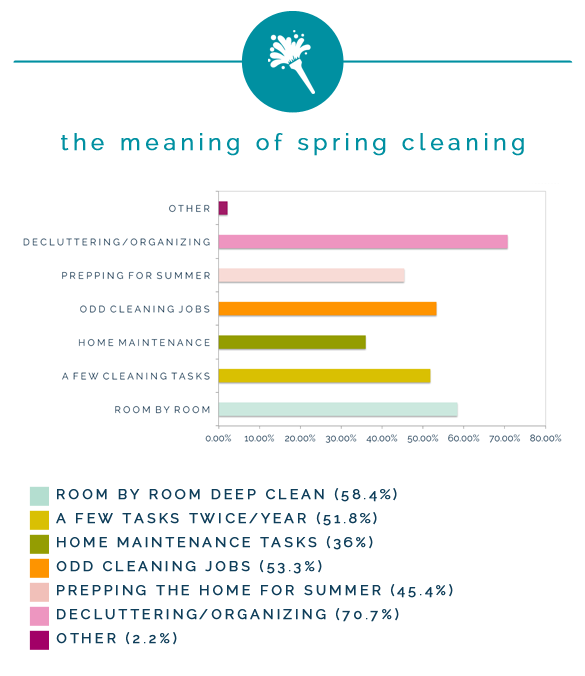 Spring cleaning, here we come! Love your graphs! Can you tell me how created them? Do you use a specific program? Hi Nina! I made the graphs in Microsoft Excel and then pasted them into the larger graphics I created in Photoshop. Such a fun post! Interesting to see the results. Thank you for taking the time to put this together. Great post! I have recently found myself in the 'Home Maintenance' camp for spring cleaning activities this year. 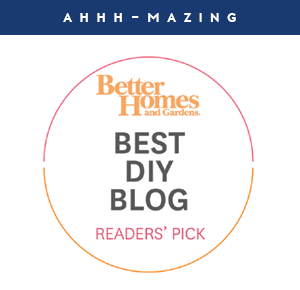 When our basement flooded in December it really hit me just how important it is to keep up on our home maintenance checklist! I can't wait to see what you come up with! I am SO sorry to hear about your basement! Ugh, leaves a pit in my stomach (we have been there, grateful for our home/roof but it is an awful experience). I hope the rebuilding/recovery process is going smoothly. And fingers crossed you won't have to go through that again. xo! Would you happen to have a tutorial on how to create them in Excel? SO excited for your upcoming posts! 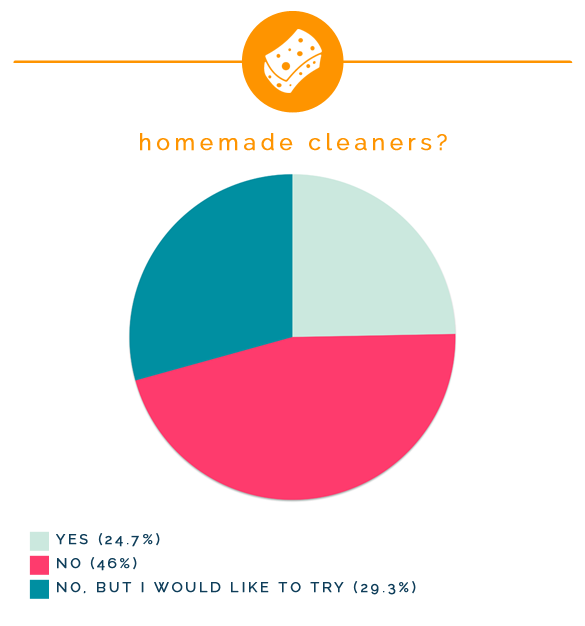 I would really love to know more about your homemade cleaners. In particular, how long is the "shelf life" once you mix them together? I can't imagine having time to mix up a fresh batch every time I need to clean (baby would be up from his nap by then! ), but if I could make a spray bottle or two and it would last a while, then that could be ideal.